Work is just piling up :(Â and recently, I haven’t been cooking much (save and except sausages and eggs on toast). So, it if pleases you, may I re-release one of my food review archives to set you drooling! My office is located along Jalan Tuanku Abdul Rahman, Kuala Lumpur. Most of the food stalls, coffee shops and restaurants around here sell predominantly Malay and Indian cuisine. Not too long ago, there used to be a coffee shop (known as “kopitiam” here in Malaysia) near my office which is operated by a chinese owner and sells chinese food. The kopitiam has since closed as the owner of the building sold it off to somebody else. There goes our morning breakfast and tea joint. It was replaced by a spanking new look restaurant and looks up-market. Today, my boss and I decided to give it a try and see if it is a worthy successor to our kopitiam. The new restaurant is simply named ABC (Always Best Choice). We have always noticed that the lunch time crowd is good. Anyway, it is located on the ground floor of Selangor Mansion along the famous Jalan Masjid India. By the way, it is a corner lot, as you can see from the picture on the top left. A menu table is placed outside the restaurant for you to browse through and it states the prices as well. The pictures in the menu looks good and we decided to head in. 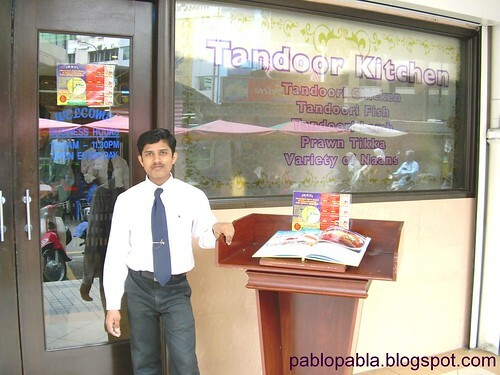 Of by the way, there is also a friendly waiter outside the restaurant who greets you and opens the door for you. Restoran ABC serves Indian, Western and surprisingly Chinese food as well. Since we intended to check out the Indian food, we did not spend too much time pouring over the Western and Chinese Menu sections. 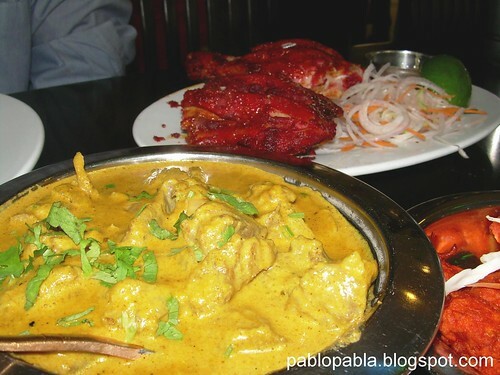 We decided to order 3 garlic naans, 2 tandoori chickens, one portion of mutton kurma and one portion of gobi vegetable. Gobi vegetable is cauliflower florets marinated in spice and deep fried. It tastes good and the spice is not hot at all. Very unique way of cooking cauliflowers, I must say. 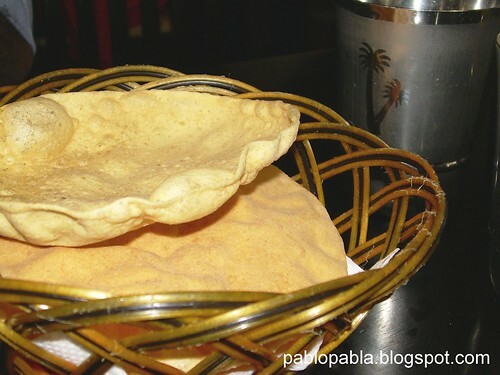 Whilst we were waiting for our food to come, we were served with papadums in a basket. These papadums are freshly fried and not oily. Good for some bites whilst chatting over the table. The kitchen is open-concept type and separated by a clear glass window. You can see the chefs working their way in the kitchen and it is during this time that I saw one of the chefs mixing the marinade over the cauliflowers prior to frying them. Before long, the dishes came. They look very good indeed. The mutton kurma comes in a semi-thick fragrant gravy and very fresh indeed. The mutton comes in reasonable portions and the dish is excellent. It goes well with the garlic naan. 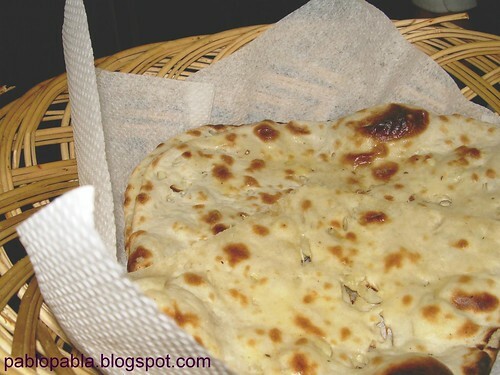 The garlic naan is thin but not baked till it is too crispy. The size is about your average personal pan pizza. The garlic and butter smell is absolutely heavenly and tastes just as great. It does not have the floury taste that is associated with some poor quality naan served at some places and it is as good eaten on its own. (Sounds like Gardenia bread advertisement) But seriously, this garlic naan is worth eating. The highlight of our lunch was the tandoori chicken. We get a sizeable portion each as reflected in the picture above complete with sliced onion salad and half a lime. Oh yes, I must also mention the mint sauce that came with it. I finished all of it. It is THAT good! 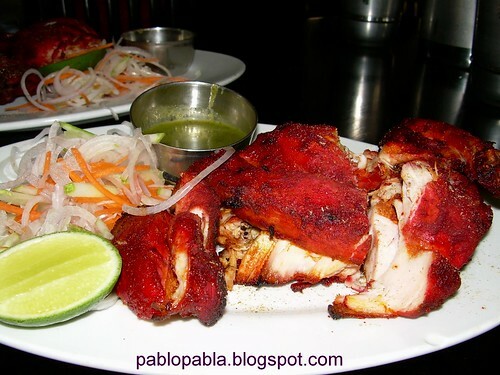 The tandoori chicken is freshly baked in the tandoori oven and the flesh remains tender and juicy. This must be attributed to the skills of the tandoori chef working in the kitchen. The marinade is also just nice, fragrant and not too overpowering. We thoroughly enjoyed our lunch and will definately bring our clients to this restaurant when they come to our office. The restaurant is very clean inside and the decor is simple but cosy. The wash basin is also kept clean and separate from the dining area and comes with ample supply of soap and paper towels. Hey! 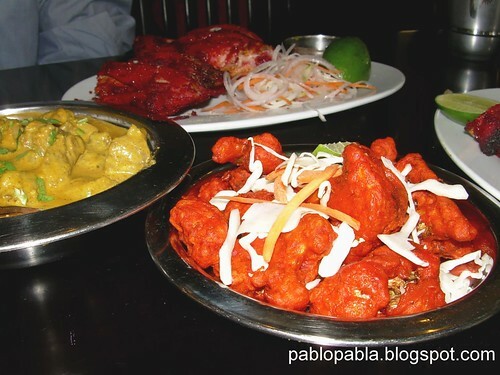 Tandoori must be experienced with your hands for great effect! You can also have their set-lunches at RM7.50 each consisting of rice, meat (chicken, fish or mutton) and side dishes. 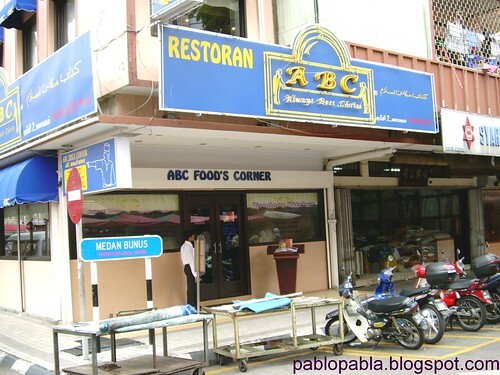 Restoran ABC is open everyday from 11am till 11pm. It is located at No. 1009, Selangor Mansion, Jalan Masjid India, 50100 Kuala Lumpur. Since the above trip to Restoran ABC back on 11.08.2006, I’ve revisited that place countless times and have not been disappointed once. Give it a try when you are around this area. Pretty cheap food.. for so much food. oo.. makes me wanna find northern indian food now. I also love indian food! Wow, the portions huge hor (larger than US portions). Oh the indian food in US, portions are not that huge, plus not as cheap as this ABC restoran…. The only economical way to eat indian food in US is to have their buffet. Ooohhh..I love all those food you order…. I like your idea of the archives. is it a plugin that you are using? mspretty : Northern Indian food is well known for its nice aroma and clever blend of spices. Yummy indeed! ParisB : You must! You must! Mama Bok : It’s a gem of a find! Well worth the money. keropokman : I’ve lost count how many times I had tandoori there liao. tigerfish : I haven’t learnt how to cook Indian food properly…maybe because my office is surrounded by good Indian curry houses. its yammyyyy, my mouth is watering.